4. 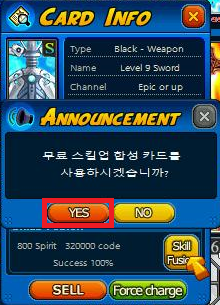 In the new window that pops up, click the red "YES" button. 6. 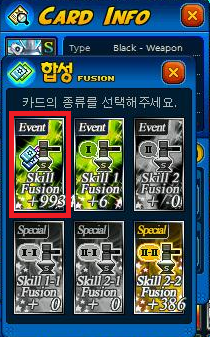 In the new fusion window, you will see the regular skill fusion layout, except instead of Elements in the first window, you will see the skill fusion card. 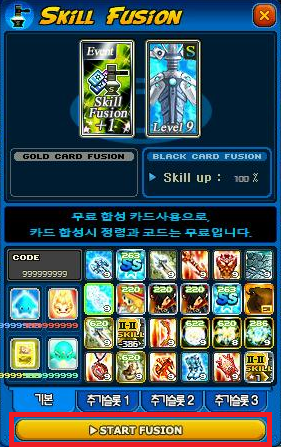 Click on the ">Start Fusion" button on the bottom. (Please note that if you click on any other card in your inventory, the fusion target will change to that item if it's eligible for an upgrade). 7. You will see a pop up appear. 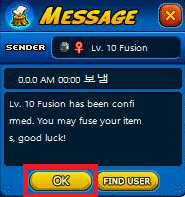 Click the "OK" button. You will then see another pop up continuing the message (4 pop-ups total). 8. Go to any lobby chat window and type in "@agree" and press Enter on your keyboard. 9. You should see your username followed by the "@agree" in the chat window where you entered it. 10. You will also get a confirmation message after you submit "@agree" into the chat. 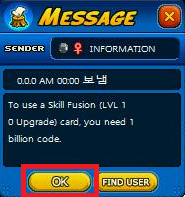 Click "OK" button to proceed. 11. 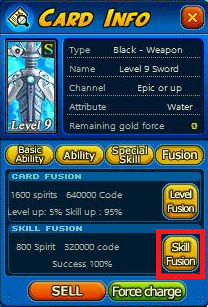 After the last step, you will now be able to go back to the skill window via the Steps 1-6. 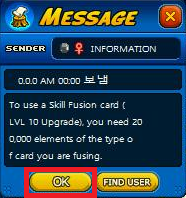 At this point, pressing ">Start Fusion" will now allow you to attempt fusing the card without any messages popping up. 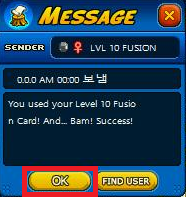 If you get the following message, this means your fusion has succeeded. Congrats! 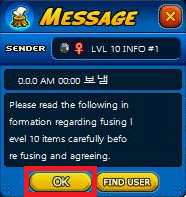 Press the "OK" button in each message to close them. The following message will be sent to all users currently in the server showcasing your achievement! 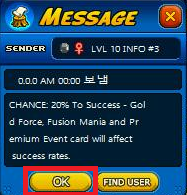 Press the "OK" button close the message. 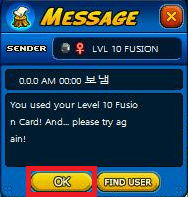 If you get the following message, this means your fusion has failed. Press the "OK" button in each message to close them. 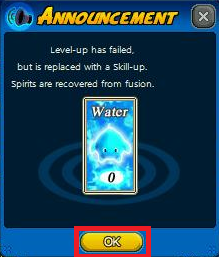 (Note: the skill of the item does NOT change! It remains the same as it was before the attempted fusion). If you get the following message, it means you you do not have enough of the resources (code or elements) to upgrade. 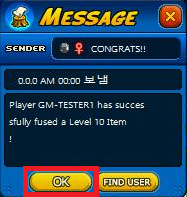 Press the "OK" button in each message to close them.